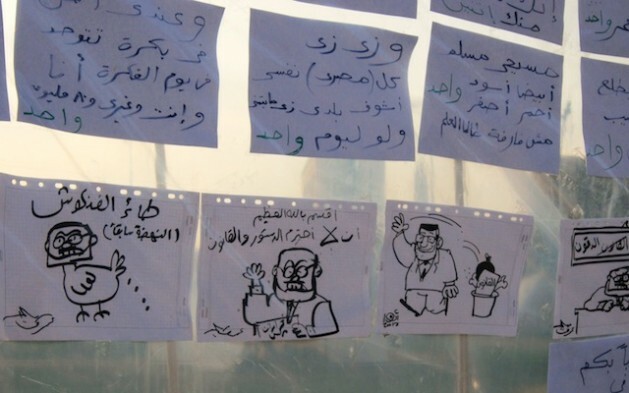 Egyptian protesters post their criticism of the president on a board in Tahrir Square. Credit: Cam McGrath/IPS. CAIRO, Jan 19 2013 (IPS) - Egyptians love to have a good laugh. At every opportunity they rattle off jokes and take jabs at themselves, their society, and – where they dare – their ruler. Former president Hosni Mubarak was a regular target of the country’s satirists and wisecrackers. The egregious corruption, cronyism and social injustice under his three decades of authoritarian rule provided rich fodder for their quips and snarky critiques. But draconian press laws and a network of strait-laced government informants discouraged Egyptians from overtly expressing their incorrigible political wit. Criticism of Mubarak was something to be shared among trusted friends, sent as an SMS, or masterfully veiled in symbols and allegory. With the fall of Mubarak and easing of media restrictions Egyptians felt free to express their political views and subversive humour without fear of reprisal. The shifting political landscape and new climate of freedom set the stage for Bassem Youssef, a cardiologist turned comedian who became a household name in early 2011 after posting clips on YouTube lampooning state television’s fumbling take on the revolution. He now hosts a slicker weekly show, Al Bernameg (The Programme), which is aired on a private satellite channel and is consciously modelled on The Daily Show with Jon Stewart in the U.S. In it he mocks biased local news coverage and irreverently satirises public figures, taking shots at politicians, Islamists, members of the old regime, and even his own network heads. Heba Morayef, Egypt director of Human Rights Watch, describes the “rise in criminal defamation cases, whether it is on charges of defaming the president or the judiciary” as the “greatest threat to freedom of expression” now facing Egypt. She says the cases are likely to increase “because criminal defamation is now embedded” in the constitution that was passed last month in a highly divisive referendum. Morsi’s administration has repeatedly denied any intention to censor opinion and insists it had nothing to do with the charges brought against Youssef. The lawsuit was filed by an independent Islamist lawyer with a history of lodging defamation suits against public figures seen to offend Islam. Another individual has filed a separate lawsuit demanding that authorities shut down Al Bernameg and revoke the station’s licence. Under Egypt’s legal system, anyone can file a lawsuit for libel or slander, even if they are not the target of the alleged offence. It is up to the public prosecutor to decide whether there is enough evidence to refer the case to the courts. The public prosecutor has been unusually busy since Morsi took office, says Gamal Eid, executive director of the Arabic Network for Human Rights Information (ANHRI), a Cairo-based rights group. He is aware of at least 24 individuals formally accused of “insulting the president”, which carries a maximum sentence of three years’ imprisonment. “We’ve seen a huge increase in the number of defamation cases in the six months under Morsi when compared to 30 years under Mubarak,” Eid told IPS. The barrage of lawsuits has had a chilling effect on journalists, caricaturists, writers and television presenters. It has also made Egyptians wary of what they say online. In September, a court handed down a prison sentence to a citizen for insulting the president in comments posted to his Facebook page. Earlier this month, the public prosecutor launched an investigation against columnist Gamal Fahmy after the presidency filed a complaint accusing him of insulting the president. Fahmy had accused the president of complicity in the death of journalist Husseini Abu Deif, who he claimed was targeted by armed Morsi supporters during violent clashes last month because he had exposed how the president “abused his power” to have his brother-in-law released from prison. Fahmy, who served a six-month prison sentence under Mubarak for his critical writings, now faces the prospect of incarceration under Morsi. ANHRI’s Eid says that rather than reforming Mubarak’s repressive media laws, the Morsi Administration is using them to intimidate and silence its political opponents. Article 179 of the Penal Code criminalises insulting the president without defining what constitutes an insult, permitting broad room for interpretation. He adds that granting the president immunity from critical opinions – whether expressed through commentary, caricature or satire – leaves the door wide open for dictatorship. There seems to be two Egypts now. The urban, secular literate and the illiterate religious poor in the country-side who blindly follow their religious leaders. Egypt is a democracy and the voters in the rural areas are the majority.